DART undertook a diurnal thermal experiment at Harnhill in Quarry Field and Cherry Copse between the 18th and 21st June 2012. Three sensors were used to measure the thermal infra-red: a low cost thermal video camera, a quantitative thermal imaging camera (model Testo 875) and a FTIR. The thermal camera was provided by the West Lothian Archaeological Trust. A photograph taken as part of the DART thermal experiment. A video from the thermal video camera. A time lapse video of the scaffolding being erected in Cherry Copse. This dataset contains all data related to the diurnal thermal experiment conducted at Harnhill. At each study site temperature readings are provided by the weather stations (reading at half hour intervals) and the sub surface probes (measuring at hourly intervals) both within and outside the archaeological sediments. Analysis of the temperature data from Quarry Field at Harnhill showed a diurnal variation between the archaeological sediments and the surrounding soils which was most pronounced in the near surface probes at <10cm depth of cover. This difference is of a magnitude that can be detected by an aerial thermal sensor. In addition Quarry Field has heavy, clay, soil. Detection of archaeological features in heavy soils is notoriously difficult. 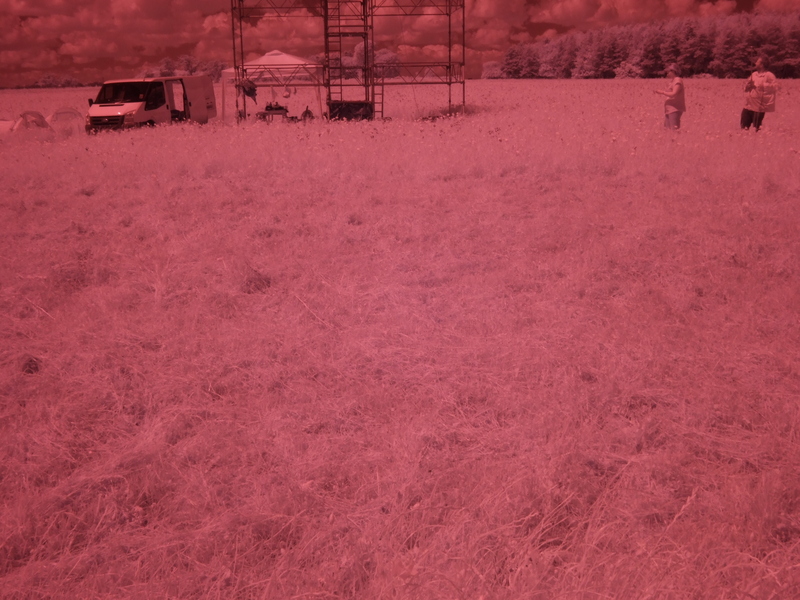 This difference potentially demonstrates that thermal wavelengths can be used to detect archaeological features. Unfortunately, due to the installation process, the area where the probes are installed has minimal vegetation cover and are therefore not compromised by any thermal blanket effect from the vegetation canopy. It was therefore proposed to conduct an experiment using thermal imaging and FTIR technologies to determine the attenuation effects of the vegetation canopy on thermal measurements from an aerial platform and to refine measurements within the thermal wavelength. The DART team members collaborated with John and Rosie Wells from the West Lothian Archaeological Trust who have deployed a lightweight thermal video camera from a kite platform and Dr Graham Ferrier from the Department of Geography at the University of Hull who specialises in the applications of FTIR and thermal imaging for geological applications. The aim of the experiment was fourfold: 1. to collect temperature variations throughout a diurnal cycle to understand the impact on temperature dynamics on archaeological detection. 2. to determine the impact of the crop canopy on the detection of archaeological features. 3. to evaluate the use of FTIR on archaeological detection. 4. to compare the imaging measurements with the results from in-situ subsurface and ambient temperature sensors. Three sensors were used to measure the thermal infra-red: a low cost thermal video camera, a quantitative thermal imaging camera (model Testo 875) and a FTIR. The thermal video camera was provided by the West Lothian Archaeological Trust. This camera is also light: this means it can be easily deployed on either a UAV or kite. The video output from this camera was captured on a dedicated video capture device meaning that video was captured for the full diurnal cycle. The Testo 875 thermal imaging camera was provided by Kings College, London. This camera is designed for quantitative scientific analysis, is calibrated. This camera is manually triggered with images taken at half hour intervals. Images are stored in a proprietary format on an internal SD card. The FTIR was provided by NERC Field Spectroscopy Facility (FSF). In order to examine contrast between the sub-surface archaeological feature and the surrounding soils it is important to achieve an Instantaneous Field of View (IFOV) that encompasses both the archaeological feature and the surrounding matrix. 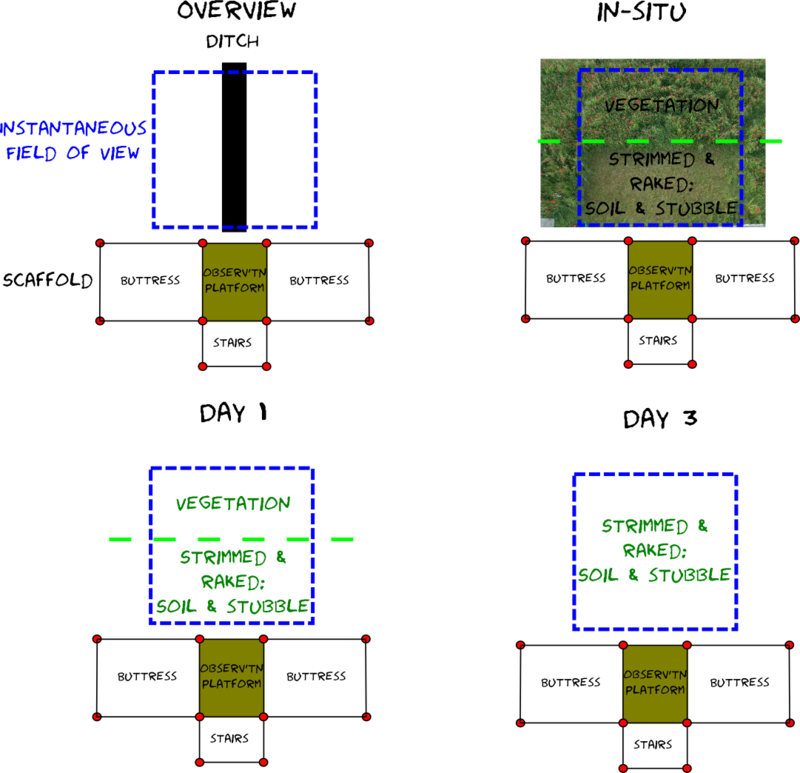 Based upon the field of view of the imaging cameras and guidance on safe operating height a height of approximately 8m is required to collect a 5m wide image on the ground. In addition it is necessary to compare changes over time so it is important to co-register images taken at different time frames. 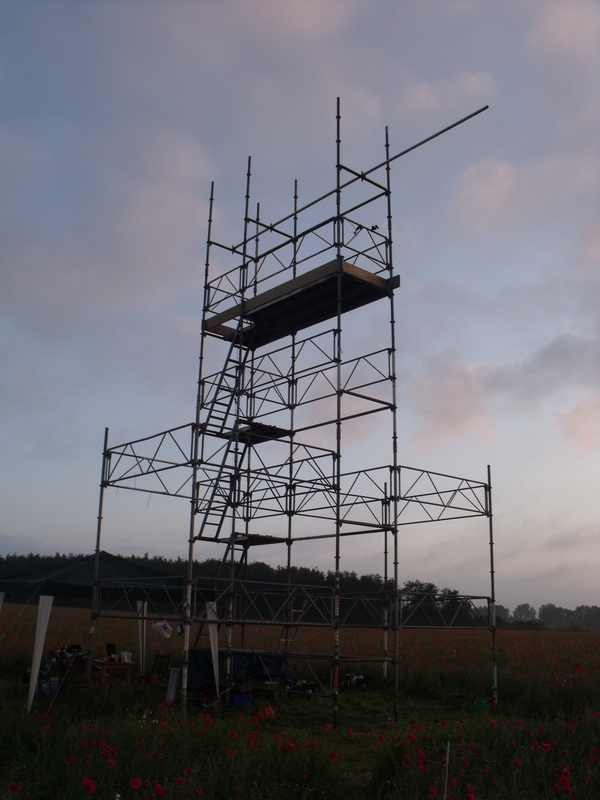 With these two factors in mind it was decided to employ a scaffolding tower to provide both elevation and a stable platform for repeat measurements and to place ground control markers for rectification. Candles in jars provided this purpose. Three lit candles were placed over known points for a period of 10 minutes and removed prior to taking readings. This warmed the soil providing both rectification points and a target to focus the camera. During the experiment the aluminium candle cases were used as these had different emissivity characteristics which meant they showed up permanently. Rather than taking measurements on different days with and without the crop it was decided to strim half the IFOV prior to measurement to directly measure the contrast between soil and crop. The rationale was based on the lag effect that would occur after the crop was harvested which means that the subsurface soils would take some time to achieve the ambient dynamic temperature range of bare soils throughout the diurnal cycle. It was, therefore, proposed that any site would have two batches of diurnal measurements: one with the crop half removed from the IFOV and the other with the crop fully removed from the IFOV. Fieldwork commenced on the 18th June 2012. The survey areas in Cherry Copse and Quarry Field were set out. The appropriate segments were strimmed with the surface raked to clear vegetation to leave stubble and bare soil exposed. 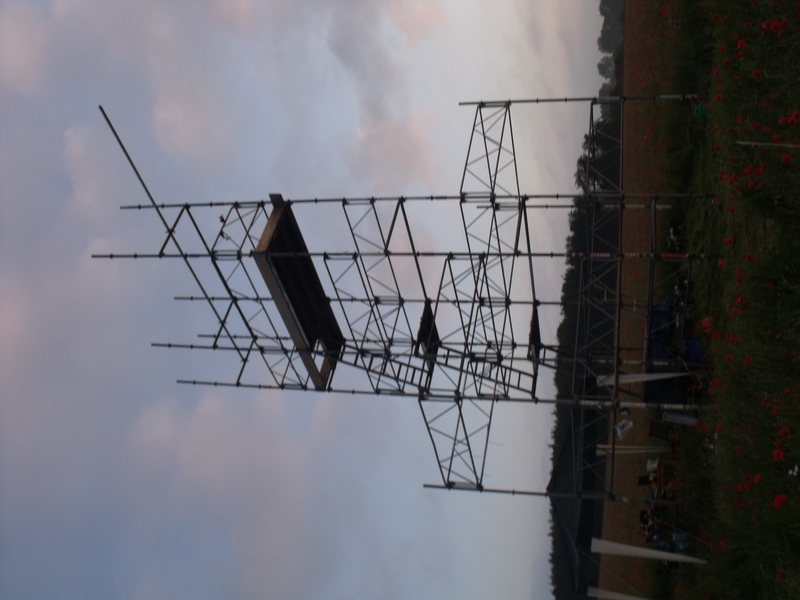 The scaffolding towers were erected and generators installed. Thermal video and imaging measurements commenced at Cherry Copse at 16:15 on Monday the 18th June and concluded at 16:20 on the 19th June. The weather was clear for the duration of the experiment. The remaining part of the area in Cherry Copse was strimmed and the surface raked. The equipment was re-established at Quarry Field with thermal video and imaging measurements commencing at 17:45 on the 19th June. 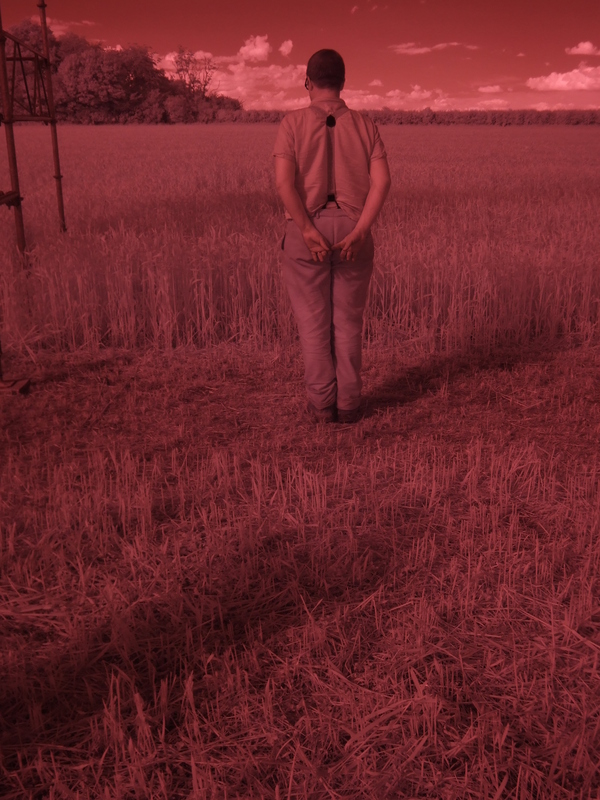 The ditch feature was easily identified in the crop on the first thermal image. Detecting features in heavy, clay, soils represents the largest gain to the archaeological community. As the weather forecast predicted rain on the Thursday it was decided to continue measurements at Quarry Field. The first diurnal cycle measurements concluded at 17:45 on the 20th June. At this time the remaining part of the area in Cherry Copse was strimmed and the surface raked. Measurements continued in Quarry Field until 17:45 on the 21st June. Half a 5x5 are was strimmed of crop over an archaeological feature. Over a 24 hour period images were taken with a thermal imager and thermal video device (at 30 minute intervals for the thermal imager). After 24 hours the remaining area was strimmed and left for fallow for 24 hours. At this point a further 24 hour survey was undertaken. Anciallry photographs and measurements were also taken.